The former Litho Press building at 800 North Capitol in Indianapolis had long been an abandoned historic structure till a redevelopment project allowed for the complete restoration of the building to feature 111 apartment units. In March of 2013, Western Waterproofing, a member company of Western Construction Group, was called in for their specialty expertise to work with the general contractor and engineers to completely restore the deteriorated concrete and facade of the building. Originally, the engineer projected this project to last 3 to 4 months, but once building demolition began, they learned that the deterioration was much more severe than originally anticipated. The support columns were severed 20” in diameter and the building beam deterioration ranged from 6 to 24” inches in depth. With the scope of work drastically increasing, Western had to work overtime to try to stay within the tight timeline and budget restraints, and every detail had to be meticulously coordinated to allow several trades to complete their work simultaneously along side of each other. 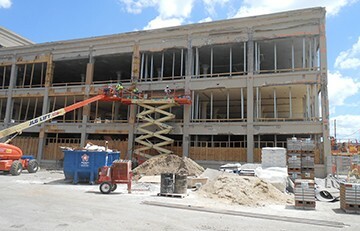 Western used a combination of scissor lifts and articulating booms while completing the exterior building repairs. The entire exterior was first sounded and marked to help budget the escalating quantities. After sounding, Western removed the deteriorated concrete, replaced the steel reinforcements as needed per engineer direction, formed each individual patch, and poured back cementitious bag mix material using 5 gallon buckets. After approximately, 8800 man hours and 3 semi trailers of cement bag mix material, 800 North Capitol restoration was successfully completed in September of 2013.